The Beast from the East has blown its way across the British countryside, leaving thigh high snowdrifts barring paths and roads, and my workshop with iced buckets holding their few flowers in a cement-like grip. I’m normally crouched in my blocks, ready for the starter’s gun to fire on the first day of March – sprinting off (metaphorically at least) for my seed packets and taking over the house with a compost invasion. But with the mercury hovering below zero throughout the past week, I’ve only so far sowed a bit of Larkspur and Molucella – leaving them to freeze their proverbial bits off in my unheated greenhouse, figuring that any seed which likes a period of cold would relish the unseasonal conditions (and if I can do this in the greenhouse it saves my family a nasty shock when they open the fridge). In a week’s time, I’ll be nice to these frozen seed trays and bring them into the warm to see if they will reward me with an instant burst into life. It’s a nice theory anyway – seeds bursting into life feels like a distant glimmer as snow still drips all around me. 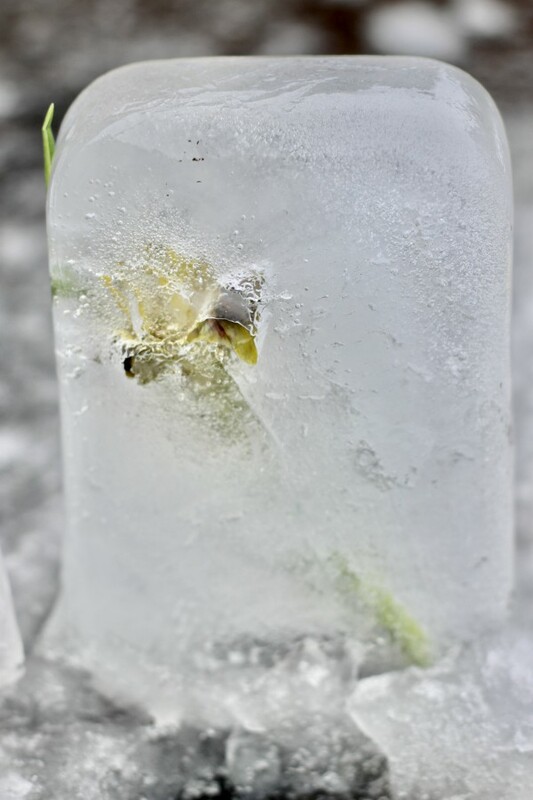 Sowing seeds right now is nigh on impossible as all I have to hand are a few giant compost ice cubes, and the workshop temperature feels even lower than the outdoors so I can’t even put the bags in there to thaw. I’m doing a trial of Fertile Fibre seed and potting compost this year, so am itching to find out how that goes – it certainly feels like a beautifully soft and light material to handle, and I’m eager to see how it compares with standard multi-purpose. The week before the Beast arrived the garden felt quite optimistic, with hellebores nodding in the morning mists, and tulips starting to get a wriggle on, lifting their leaves above the damp crust of soil. 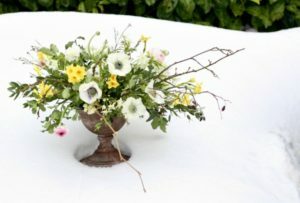 I did cover up my hellebores with dry, straw-like debris, upturned plant pots, hedge pruning and anything else I could lay my hands on before the Beast arrived, in an attempt to cosset them through the worst of the weather as I’d dearly love them to make themselves available for my spring weddings later in the season. With temperatures forecast to be in positive single figures again next week, I’ll disentangle everything to see if the strategy worked. 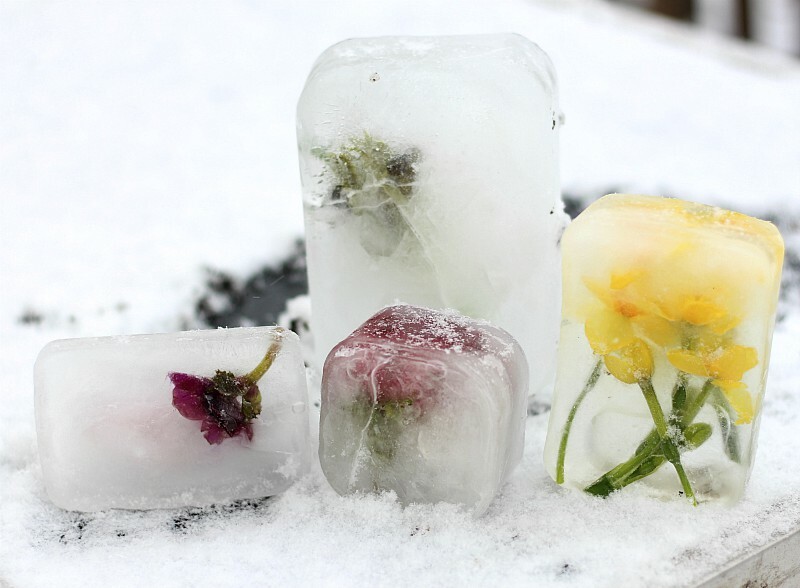 I’m also holding my breath to see if the ranunculus have made it through the big freeze as they are not known for their resilience to prolonged sub-zero conditions. Tales of them parting from frozen root systems without so much as a sigh abound on Flowers from the Farm chat forums, and I can only hope that mine exhibit a bit more spine, but I fear it may be a vain expectation. Such is the joy of being a flower grower – you never know what the weather is going to throw at you and just because one year you have things in flower at the start of March, there’s no guarantee that this will be repeated in future seasons. Last year’s late spring heatwave brought me peonies in May (a month early), but on the bright side, this year’s ‘proper’ winter should encourage the tulips to elongate their stems from the grumpy stumpy incarnations which they’ve evolved into in the last three years mild conditions. I’m waiting for the snow to clear to make an assessment of casualties. I suspect my established Rosemary plants my well choose to disestablish themselves in the face of un-Mediterranean conditions, and my gloriusly perfumed Daphne, which already looked petulant before the onslaught, may have finally picked up its ball and taken it home for good.